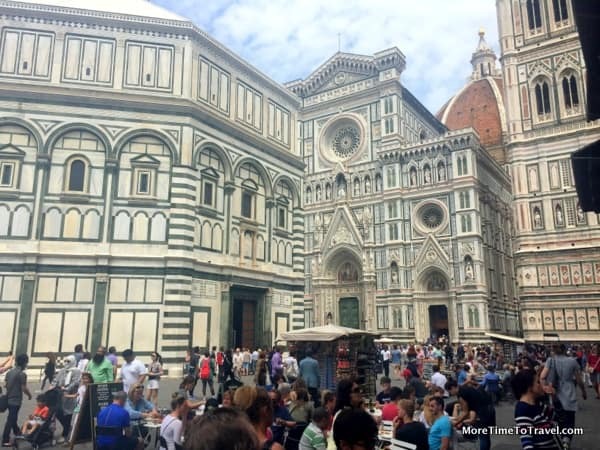 We had a great day planned with friends: a morning tour at the Uffizi Gallery; followed by lunch at one of our favorite restaurants in Florence, Trattoria Cammillo; and an on-our-own walking tour of the city in the afternoon. Although it was only May, the changeable weather had turned oppressively hot and humid. After retrieving our rental van from one of the city’s public parking lots at the end of the day, I noticed that both my legs had a now-recognizable red rash just above the ankles: telltale sign of Golfer’s Vasculitis. Last year, I encountered this same, often misdiagnosed, malady for the first time. After a long, hot, but enjoyable day exploring the historic center of Orvieto, I was proud of the miles I had logged onto my Fitbit. But I freaked out when I glanced down at my legs. Had I been bitten by an insect or spider? Even worse, bedbugs? Was I allergic to new laundry detergent or the bedding in the room? Was it cellulitis? The mind does tend to wander. It turned out to be none of the above. Like any good researcher, I self-diagnosed my case of Golfer’s Vasculitis after finding pictures of equally ugly legs (and some worse ones) on Google. My physician confirmed the diagnosis after I sent him an email with a series of “wish-you-were-here” photos. 1) Golfer’s Vasculitis is usually harmless, resolves on its own, and affects people who are relatively healthy. It is a form of vasculitis (an inflammation of blood vessels) that appears as a rash, usually above one’s ankles (above the sock line, if you are wearing them). It can extend as high as one’s thighs and affects both legs rather than one. The red spots are hot and feel like sunburn. The rash usually doesn’t itch or blister but can cause swelling, especially around the ankles. It looks worse than it feels. 2) To promote awareness, medical researchers have suggested calling the condition Golfer’s Vasculitis. 4) Situational/environmental factors also come into play. The condition tends to occur among at-risk individuals (already predisposed to getting it) who spend extended periods of time on their feet in hot, humid climates. 5) Unfortunately, there’s little you (or I) can do to prevent Golfer’s vasculitis. Aside from staying hydrated and stopping to elevate your feet whenever you have the opportunity, there aren’t many practical prevention strategies. Experts recommend wearing open shoes that are more breathable. Although flip-flops or sandals might reduce the odds of the rash appearing, they predispose travelers to other dangers, especially when walking on uneven streets or in crowded places. Others suggest wearing compression hosiery, although it can be quite uncomfortable when visiting hot, humid places for extended periods of time. Hi Irene! I get this, too, and have for years, off and on, when I’ve done a lot more walking than usual. I had never heard it termed Golfer’s Vasculitis or the others you mentioned, however! I looked it up on dermatology sites and cannot find what term I found years ago, but now I know it’s temporary and not a serious condition. I have had swelling along with it a couple of times, though, and wear compression knee-high stockings on flights. I don’t think this is what you get on flights…but I’m so sorry to hear that you share my misery, Debbra! Alyssa and I swear by these sandals. Their bottoms are like athletic shoes. The only danger of shoes like this as walking shoes (like other sandals) is that they leave your toes exposed to dangers…Better than flip-flops for sure! My hubby has had this quite a few times after long hikes or long (6 hour) walks in crowded cities pounding pavements and we’ve wondered what it might be! Now we know! Thanks Irene! Although I now feel a kinship with your hubby :-), I’m sorry that there are so few ways to prevent it! Knowing what it is does allay anxiety. OMG I’ve never heard of this and when I looked at your list of who is at greater risk, I was so ticked off! Women, over 50….same demographic for those most likely to get frozen shoulder (Yup, got it in both shoulders). Glad to hear it isn’t too painful, although it certainly looks like it is. Thanks for sharing….I think! Now, I’ve gotten to google “frozen shoulder.” Hope it’s not too painful either. I didn’t know this had a name! Thank you Dr. Levine! Good to know about this. I’ve never had Golfer’s Vasculitis. I would have imagined all kinds of things about it – like you my mind would wander. I hope I don’t ever get it, but if I do I’ll now know what it is and not imagine the worst! Yes, it’s always tricky to diagnose. Disney rash is a great one. I have not heard of this malady so this was quite informative. I hadn’t heard of it either, until I Googled it! I’ve never heard of Golfers Vasculitis – and I’m a golfer! Oh the joys of being over 50. I’ll be on the look out for it now. Thanks for the great information. Consider yourself lucky! But now you’ll be able to spot in the course:-) Look just above the sock lines of your golf buddies! Well, I learn something new every day. Now I will quickly try to forget this:) Here\’s to you never having to deal with it again. All things considered…it was a minor ailment, once I knew what it was! Oh dear. Another age related malady to worry about. OTOH, I’ve never had it and I’ve done lots of walking in hot places. However, now that I think about it, I really wilt in hot humid weather, so maybe I collapse before I walk enough to give myself golfers’ vasculitis. Use voltaren emulgel (https://amzn.to/2vUcm6b) if you can get it. Its an anti-inflammatory you apply to the skin for muscle inflammation but works wonders on inflamed capillaries just under the skin (they radiate heat so there’s inflammation going on). Apply several times per 24 hours til gone. Should be gone in 2 days. Only thing that has ever sped up healing for me. Antihistamines and even strong steroid creams did little to help. I get no new rash when going out again with the emulgel on. So maybe a preventative too? Worth a shot! Thanks for this suggestion. I hope to give it a try. I do lots of bushwalking and often have the hikers rash after many hours walking in the heat. The more severe the rash the longer it takes to disappear. Recently a hiking friend told me about a cooling towel from China. He took many orders and I purchased it for 8 dollars. It comes with a bottle to keep wet and cool. I need time to see if it works. Wring out wet towel, flap about and wrap around legs when stopping for morn. tea or lunch. I used to splash cold water from creeks on my legs while bushwalking and it did help. Thought I should share this with you. Sounds like something worthwhile to try! Let us know how the towel solution works out. I get it also!! I’m on my feet at work for 10 he shifts and have been getting this for years!! I never knew what it was! Thank you! !